When this card is Synchro Summoned: You can target 1 "Resonator" monster in your GY; Special Summon it. You cannot Special Summon monsters from the Extra Deck the turn you activate this effect, except DARK Dragon Synchro Monsters. During your Main Phase, except the turn this card was sent to the GY: You can banish this card from your GY, then target 2 Level 1 "Resonator" monsters in your GY; Special Summon both. This monster resembles Red Dragon Archfiend. It is possible that this monster is Red Dragon Archfiend in the process of fully taking form. 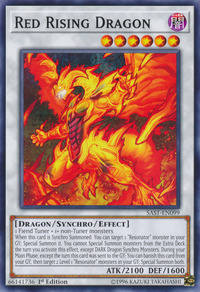 This card also resembles the fiery silhouette form that Red Dragon Archfiend assumed during Jack's Duel against Max. 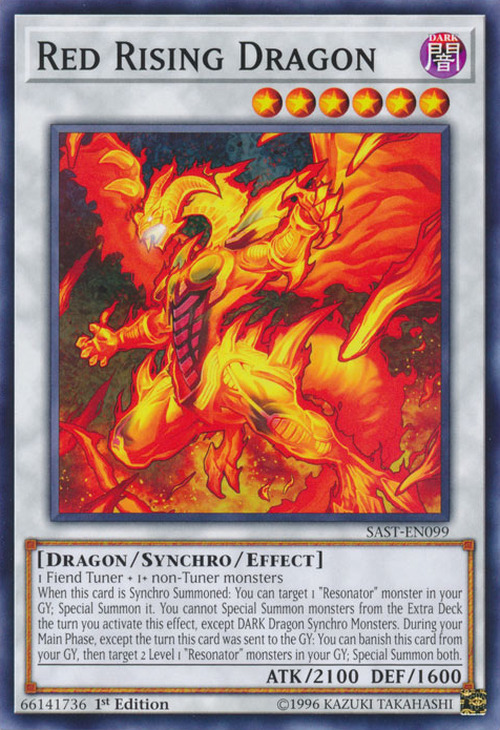 The process of summoning a Level 8 Red Dragon Archfiend monster using this card, Red Resonator, and Red Sprinter mirrors the same loop Dragunity decks use to summon Level 8 Synchro Monsters. This is ironic as the Dragunity Loop was one of the fastest ways to summon Stardust Dragon. This card has a Stardust counterpart: Shooting Riser Dragon.